Giving families with sick children a home-cooked meal and more time together. It’s Thursday evening and 12-year-old Charlie Hunter '23 has just finished cooking an enormous batch of chili with some classmates. Though Charlie and his friends are a little young to be expert chefs, it’s not their cooking skills that inspire us; it’s their desire to help others. This meal, after all, is not for them. Since 2013, 200 Halifax Grammar School students have helped the local Ronald McDonald House provide a home away from home for families of ill and disabled Atlantic Canadian children receiving medical care in Halifax through the Home for Dinner program, shopping for food and cooking meals in teams. It is community service like this that builds character in Grammar students and reinforces the school’s ‘Enter to learn, go forth to serve’ motto. "Seeing how excited people are when they receive the meals we make, and how important it is to them, makes me so happy." Gordon Stirrett with Grammar students in the Ronald McDonald House kitchen. 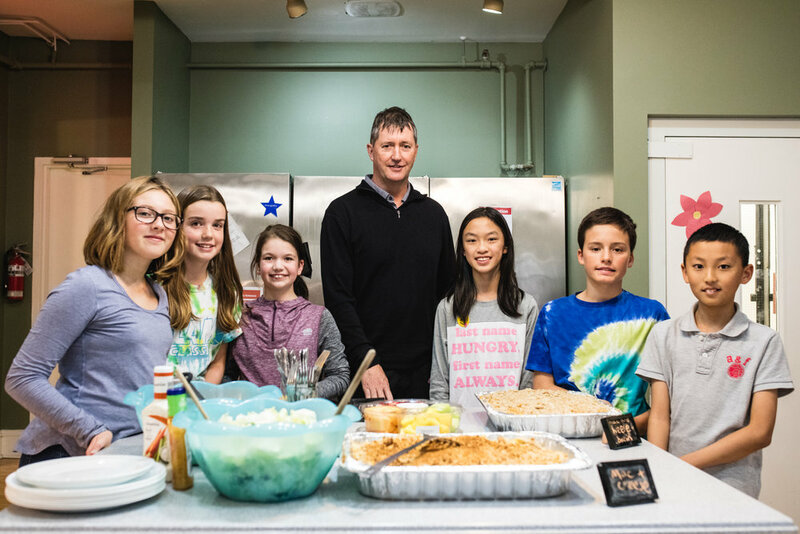 Grammar's participation in the Home for Dinner program is one of many service programs made possible by the Gordon Stirrett Wealth Management Community Service Grant, established in 2009 by alumnus parent Gordon Stirrett (Scott Stirrett '09). The grant provides seed money so students can participate in altruistic community service projects, like groceries for Charlie Hunter’s chili. “The Community Service Grant encourages students to come up with creative ideas to better the world, and to come forward with those ideas for help in getting their projects started,” says Gordon Stirrett. Since its establishment, the grant has supported several student volunteer projects, including Renuka Koilpillai's '14 Backpacks for Parker Street Food and Furniture Bank, Oliver Falvey's '13 Fins Swimming program, Nika Gantar's '16 Malala's Dream and most recently, the first ever Grammar Closet Sale, organized by Head Girl Dimitra Tsimiklis '18, which raised $4,500 for Laing House. Indeed, the Grammar volunteer opportunities made possible through the Gordon Stirrett grant promise to have a lasting impact on Grammar students, and the lives of those they touch.